Six Flags Over Georgia, located just west of the city of Atlanta, is one of the best all-day destinations for family fun, thrilling rides, entertainment, and water slides. Are you a Six Flags Over Georgia Super Fan? I am nearly there! I have enjoyed plenty of screams, laughs, and smiles at the park since I moved here fresh out of college in 1999. This means I know a thing or two about the park, the rides, and all of the new additions that have boosted Six Flags Over Georgia into superstar status over the past 3 or so years. #1: Definitely bring the kids! 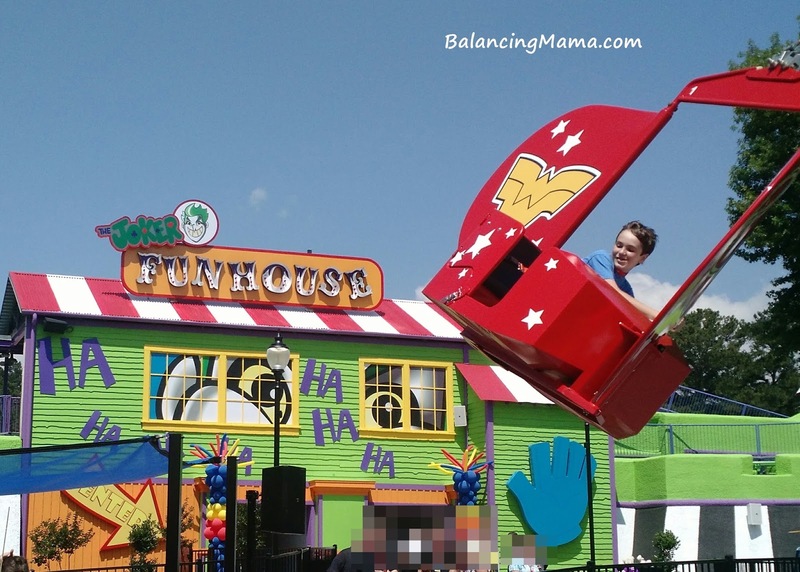 This season, Six Flags Over Georgia opened the all new Bugs Bunny Boomtown featuring seven rides and attractions for the youngest theme park fans (most are 36" minimum height) including Tweety's Treehouse and the Daffy Duck Bucket Blasters. 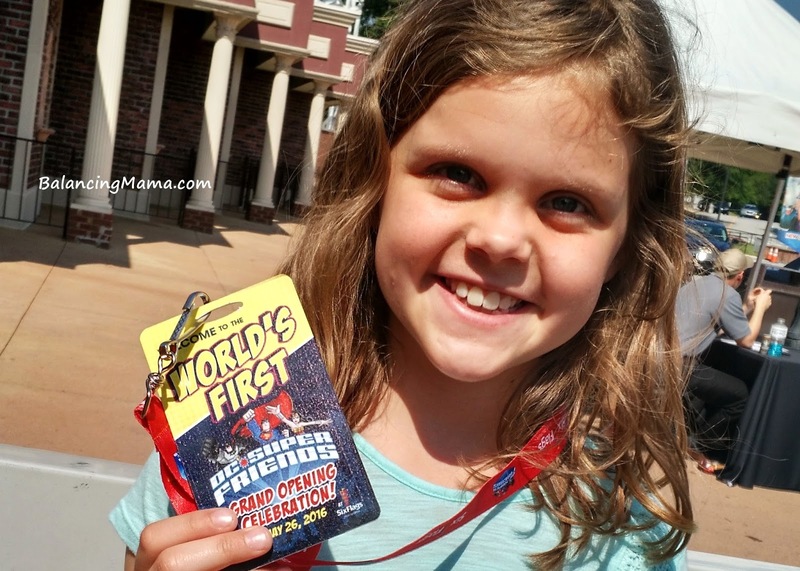 On Memorial Day weekend 2016, the world’s first DC Super Friends themed area debuted with thrill rides that are fast and fun, yet suitable for the entire family. Six Flags Atlanta Properties Park President Dale Kaetzel said, “This area, combined with the addition of Bugs Bunny Boomtown earlier this year, solidifies Six Flags Over Georgia as the perfect destination for family fun.” I toured the new family areas with my daughter a couple weeks ago. Even though she is over 54" and a mega coaster junkie, we still had fun riding the new family attractions together. #2: Get soaked at Hurricane Harbor! So maybe this is "old news", but if you have not been to Six Flags Over Georgia in a few seasons, it is time to get back - and get wet. The theme park known for awesome roller coasters and fun attractions has a water park too! Hurricane Harbor covers seven acres with a tropical theme and boasts a huge wave pool, the world’s first hybrid zero gravity slide, a children's water play area, and more. For the VIP experience, you can rent a private Hurricane Harbor cabana and have the best day ever. In May 2015, the park debuted two new crazy rides near the Batman and Mindbender (my favorite!) roller coasters. The JOKER Chaos Coaster features a sleek and fast train on one continuous loop. The JOKER Chaos Coaster rockets 70 feet in the air and glides both forward and backward through loop after loop. Also added last year, the Harley Quinn Spinsanity ride is a Gotham take on the classic tilt-a-whirl, which sends riders spinning and rolling, laughing the entire way. #4: Welcome the Blue Hawk! I admit, I never liked the Ninja coaster. It was bumpy and frankly, sometimes painful to ride. It has been retired after a long adventure. The roller coaster has been totally refurbished, repainted, and renamed and it is now open at Six Flags Over Georgia. The Blue Hawk enhancements include two new coaster trains with new soft-vest restraints for a more comfortable experience, enhancements to the 2,800 feet of track for a much smoother ride, and a fresh, new coat of shiny blue and silver paint. 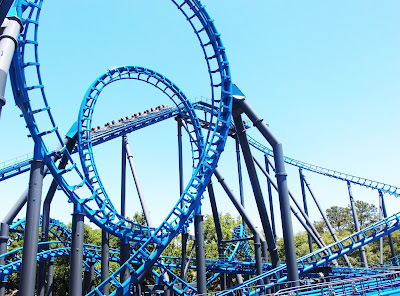 Blue Hawk was not yet open when I last visited the theme park, but it's on my list to ride soon. Six Flags Over Georgia is now open daily through August 7. For more information on the all-new Blue Hawk, DC Super Friends area, and other awesome upgrades plus park hours, visit www.sixflags.com/overgeorgia. You can also keep up with news, photos, and videos via Six Flags Over Georgia on Facebook.